As part of the LUSSO Collections member survey, the club asked "What Club features were the most influential to our Members' decision to join LUSSO ?". 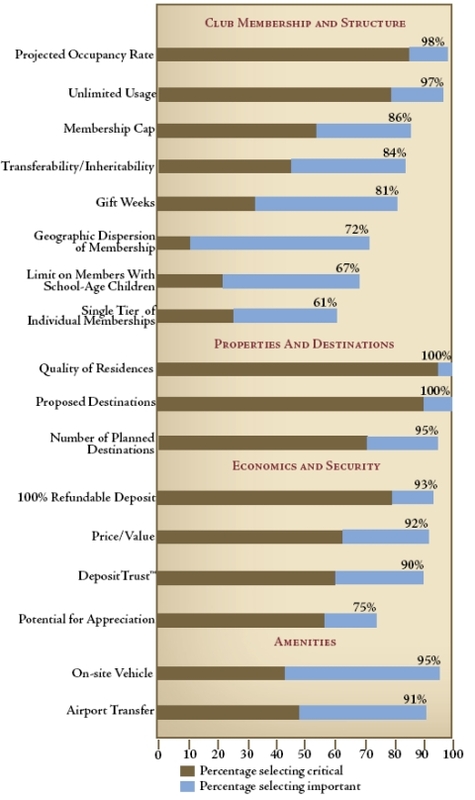 We've summarized the results below and many of the reasons members gave are true for destination clubs in general. 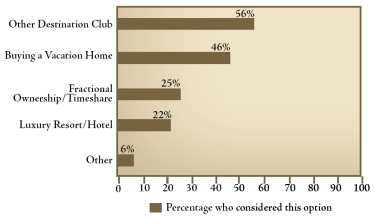 "Almost half of our Members were contemplating the purchase of a vacation home (or an additional vacation home) but decided to join the Club instead-preferring the plentiful access to a broad portfolio of destinations versus the always guaranteed access to one, but only one, destination. Additionally, you tell us that the capital and annual costs with LUSSO are, compared to vacation-home ownership, much more commensurate with your likely travel patterns. In a separate survey question 93 percent of Members rated avoiding the hassles of multiple-home ownership as "somewhat" or "very important" in their decision to join the Club." The LUSSO homes have an average value of over $3m and other destination clubs have homes with average values from under $1m to well over $5m. The LUSSO members also put a high value on the projected occupancy rate - in other words the availability of the clubs homes and how easy it is for a member to book the home they want for the time period they want. 98% of LUSSO members rated this as either critical or important in their decision to join. LUSSO offers some membership plan features that are either unique or certainly uncommon amongst the other luxury vacation clubs. For instance there is only one membership tier and members have unlimited usage of the homes (subject only to the clubs reservation policies, which mean members can have up to 49 days reserved at any one time). Members can also give two of their reservations to a family member each year and can even transfer their whole membership to a family member. The survey showed (see table below) that members placed different values on each of these, but on the whole they were certainly reasons that they chose LUSSO. Two other uncommon feature that LUSSO provides are the onsite vehicle at each home (normally a Lincoln Navigator) and the airport transfers. These are included as part of the standard membership package and are valued by 95% and 91% of the members respectively. Economics and financial security features were ranked second in overall importance by LUSSO members. The economics, especially compared to the alternatives, is a key consideration that we continue to hear from prospective members of all the clubs. Sherpareport provides a financial comparison of destination club membership compared to owning a second home, this includes a downloadable spreadsheet that you can customize for your own situation. The 100 percent refundable membership deposit was ranked as critical by more than three-quarters of LUSSO members, while the potential for appreciation, though highly desired, was less critical. The LUSSO DepositTrust structure, whereby members are effectively granted a security interest in the club's real estate assets, was ranked as important by 90 percent of those members who joined after this feature was introduced. In a separate survey question, 95 percent of LUSSO members rated as "somewhat" or "very important" the fact that the LUSSO Collections spacious residences facilitate the gathering of family and friends. This is certainly another key factor that members of all the destination clubs give as one of their reasons for joining. The large, multi bedroom family homes are very conducive to members acting as hosts and inviting friends and family along as guests. Overall this research confirmed the reasons that we hear from members. If you're interested in joining a club we offer a free 60 page destination club guide for prospective members.